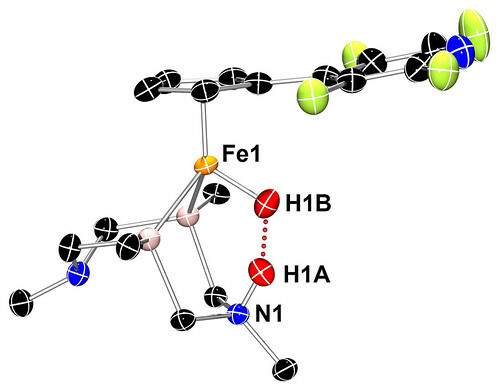 Neutron crystallography shows this iron catalyst gripping two hydrogen atoms (red spheres). This arrangement allows an unusual dihydrogen bond to form between the hydrogen atoms (red dots). RICHLAND, Wash. — Like a hungry diner ripping open a dinner roll, a fuel cell catalyst that converts hydrogen into electricity must tear open a hydrogen molecule. Now researchers have captured a view of such a catalyst holding onto the two halves of its hydrogen feast. The view confirms previous hypotheses and provides insight into how to make the catalyst work better for alternative energy uses. This study is the first time scientists have shown precisely where the hydrogen halves end up in the structure of a molecular catalyst that breaks down hydrogen, the team reported online April 22 in Angewandte Chemie International Edition. The design of this catalyst was inspired by the innards of a natural protein called a hydrogenase enzyme. "The catalyst shows us what likely happens in the natural hydrogenase system," said Morris Bullock of the Department of Energy's Pacific Northwest National Laboratory. "The catalyst is where the action is, but the natural enzyme has a huge protein surrounding the catalytic site. It would be hard to see what we have seen with our catalyst because of the complexity of the protein." If renewable power is used to store energy in molecular hydrogen, these fuel cells can be carbon-neutral. But fuel cells aren't cheap enough for everyday use. Researchers have been designing catalysts inspired by hydrogenase cores and testing them. In this work, an important step in breaking a hydrogen molecule so the bond's energy can be captured as electricity is to break the bond unevenly. Instead of producing two equal hydrogen atoms, this catalyst must produce a positively charged proton and a negatively charged hydride. The physical shape of a catalyst — along with electrochemical information — can reveal how it does that. So far, scientists have determined the overall structure of catalysts with cheap metals using X-ray crystallography, but hydrogen atoms can't be located accurately using X-rays. Based on chemistry and X-ray methods, researchers have a best guess for the position of hydrogen atoms, but imagination is no substitute for reality. Bullock, Tianbiao "Leo" Liu and their colleagues at the Center for Molecular Electrocatalysis at PNNL, one of DOE's Energy Frontier Research Centers, collaborated with scientists at the Spallation Neutron Source at Oak Ridge National Laboratory in Tennessee to find the lurking proton and hydride. Using a beam of neutrons like a flashlight allows researchers to pinpoint the nucleus of atoms that form the backbone architecture of their iron-based catalyst. "We were designing a molecule that represented an intermediate in the chemical reaction, and it required special experimental techniques," Liu said. "It took more than six months to find the right conditions to grow large single crystals suitable for neutron diffraction. And another six months to pinpoint the position of the split H2 molecule." The structure, they found, confirmed theories based on chemical analyses. For example, the barbell-shaped hydrogen molecule snuggles into the catalyst core. On being split, the negatively charged hydride attaches to the iron at the center of the catalyst; meanwhile, the positively charged proton attaches to a nitrogen atom across the catalytic core. The researchers expected this set-up, but no one had accurately characterized it in an actual structure before. In this form, the hydride and proton form a type of bond uncommonly seen by scientists — a dihydrogen bond. The energy-rich chemical bond between two hydrogen atoms in a molecule is called a covalent bond and is very strong. Another bond called a "hydrogen bond" is a weak one formed between a slightly positive hydrogen and another, slightly negative atom. Hydrogen bonds stabilize the structure of molecules by tacking down chains as they fold over within a molecule or between two independent molecules. Hydrogen bonds are also key to water surface tension, ice's ability to float and even a snowflake's shape. The dihydrogen bond seen in the structure is much stronger than a single hydrogen bond. Measuring the distance between atoms reveals how tight the bond is. The team found that the dihydrogen bond was much shorter than typical hydrogen bonds but longer than typical covalent bonds. In fact, the dihydrogen bond is the shortest of its type so far identified, the researchers report. "We're not too far from acceptable with its efficiency," said Bullock. "Now we just want to make it a little more efficient and faster." Reference: Tianbiao Liu, XiaopingWang, Christina Hoffmann, Daniel L. DuBois, and R. Morris Bullock. Heterolytic Cleavage of Hydrogen by an Iron Hydrogenase Model Investigated by Neutron Diffraction, Angewandte Chemie International Edition, April 22, 2014, DOI: 10.1002/anie.201402090. The Department of Energy's Office of Science is the single largest supporter of basic research in the physical sciences in the United States and is working to address some of the most pressing challenges of our time. The Spallation Neutron Source at Oak Ridge National Laboratory is a one-of-a-kind research facility that provides the most intense pulsed neutron beams in the world for scientific research and industrial development. SNS provides state-of-the-art experiment stations for researchers in physics, chemistry, materials science, and biology.